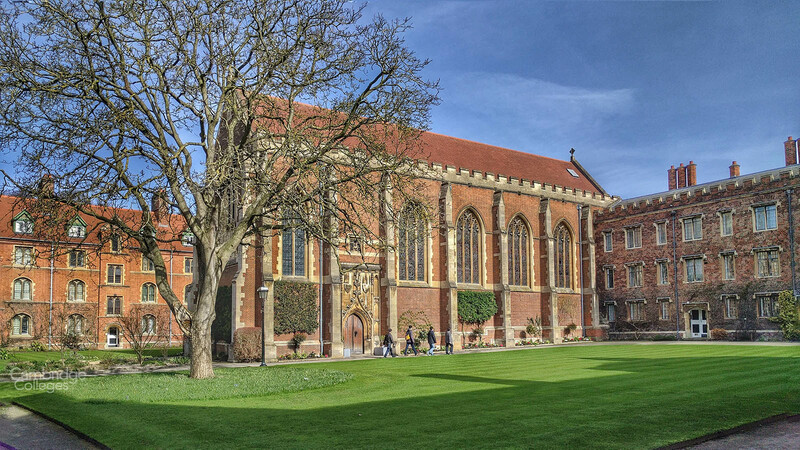 At over 550 years old, Queens’ college is one of the older surviving colleges of the University of Cambridge. As you would expect, the college boasts of an excellent tradition of education, accepting students from all disciplines. 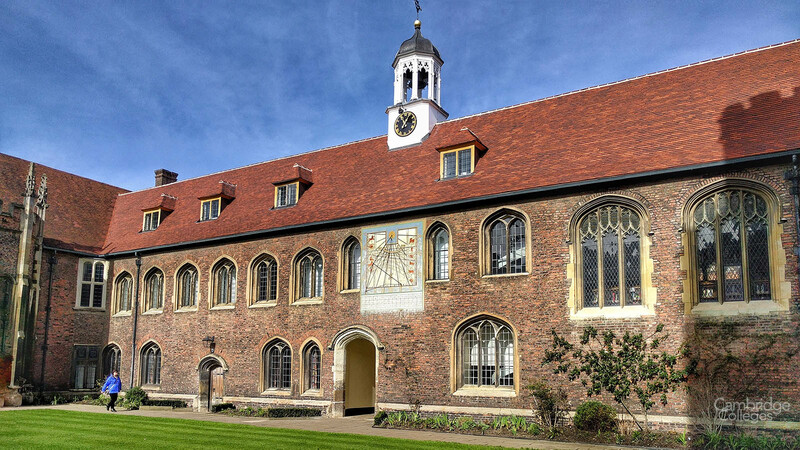 The college was originally destined to be named The College of St Bernard and built on a narrow strip of land between Trumpington St and Queens Lane (roughly where St Catharine’s college is now), having been granted charters by King Henry VI in 1447. However, this site was deemed to be inadequate, so the land where some of the original college buildings now stand was acquired. Queen Margaret of Anjou, the queen of Henry VI (founder of King’s college), obtained a licence from her husband to establish The Queen’s College of St Margaret and St. Bernard on the new site in 1448. In 1475, Elizabeth Woodville, queen of Edward IV, and Lady-in-waiting to Margaret become patron of the college and it was re-founded. This gives rise to the pluralisation of Queen in the name of the college (note the position of the apostrophe after the s, not prior to it). Aside from being a fine educational establishment, Queens’ college also is a wonderful sight to behold. The grounds house some of the most elegant structures and buildings known to architecture and engineering. The college accepts visitors not only for academic purposes but as tourists as well. 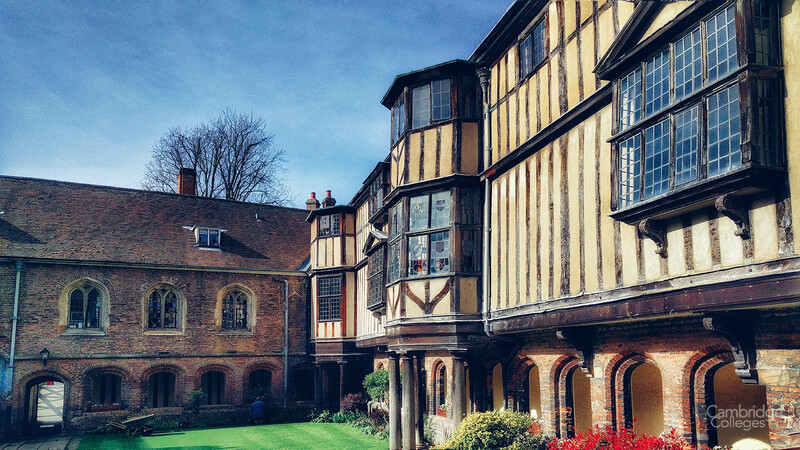 The oldest buildings in Queens’ college are the Old Court buildings (the name is something of a give away!). Previously home to Carmelite monks, but now where you can find fellows’ rooms and the college Chapel. In the 19th century, student numbers were escalating fast, and this led to the renovation of the President’s second garden into a student accommodation facility, known as the Friar’s Court. It was the first in the university to be built with modernist designs. The Erasmus building, or Erasmus court is one of Cambridge’s most notorious buildings. Designed by architect Sir Basil Spence and located well within the confines of Queens’ college, it was once, infamously described by Prince Charles as a “monstrous carbuncle on face of society” – a fairly damning review. Unless you have visited the college, or travelled along the river Cam on a punt, then you will have no idea what the building looks like. Suffice to say, it was the first modern style building to be built at a college along the Backs, completed in 1959 and, whilst arguably has now become a modern classic it certainly wasn’t popular for the early part of its life. What do you think? Throughout the years, renovations and improvements have taken place in most of the buildings and lodgings in Queens’ college. Despite these efforts, the college has managed to maintain its age-old traditions and the history that pervades in its grounds and buildings. Probably the most popular structure in the college, the Wooden bridge is more famously known as the ‘Mathematical Bridge.’ It provides for a durable walkway and a common photographic favourite. 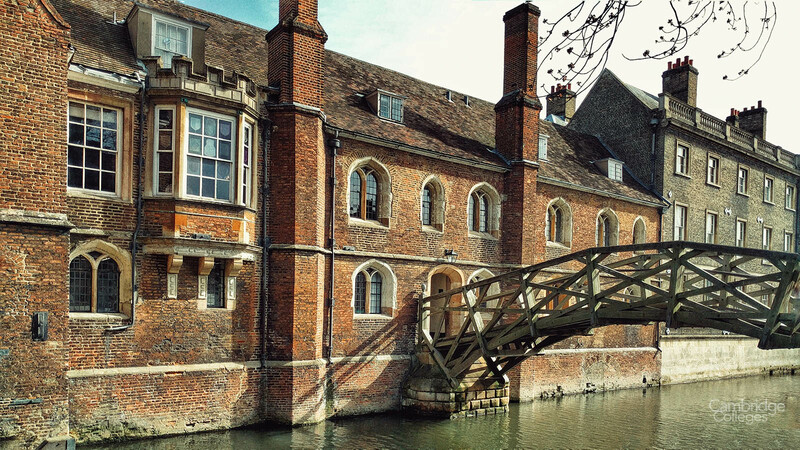 The college is located in either side of the River Cam, connected by this famous bridge. The two sides have been colloquially coined by students as the “Dark Side” and the “Light Side”. The bridge itself gives rise to a number of myths, one being that Sir Isaac Newton was the one who engineered it, without the use of nuts or bolts, urging students to disassemble and reassemble it to prove the story. You only have to stand on the bridge for a few minutes on a summer’s day to hear the many variations of this story as they are told by those on the punts passing underneath. The myth is however, just that, history tells us it was originally built from oak in 1749 – a good twenty years+ after Newton died, designed by William Etheridge and built by James Essex. A building was erected, in his honour, and named after him – the Essex Building. The present bridge was built in 1905 and constructed from teak. 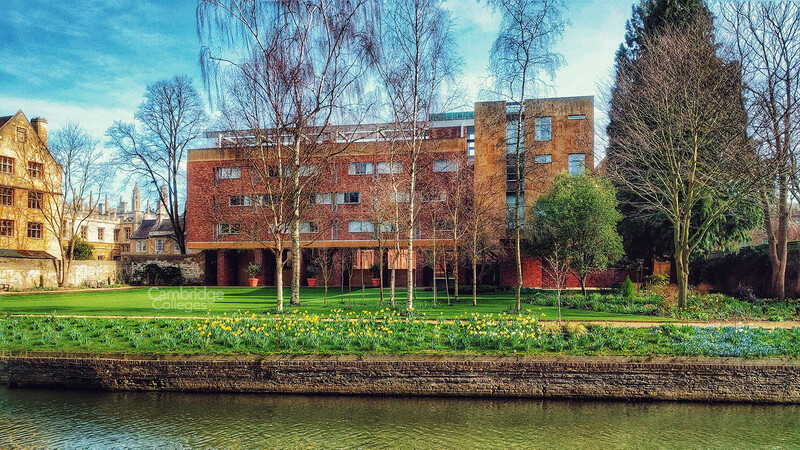 The name given to the land on the opposite bank of the river Cam, it is home to a number of modern additions to the college. Student accommodation is housed in the Fisher Building, the very first to have toilets and bathrooms located within close proximity to students’ rooms. 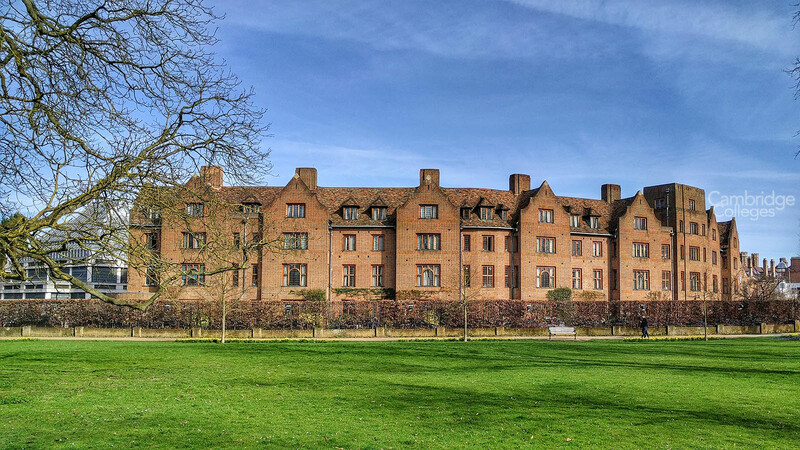 Additionally, there is the Cripps Court (one of a number at different Cambridge colleges) which has become far more than just student accommodation. It houses 171 student bedrooms, 3 rooms, a bar, fellows’ rooms, flats, a solarium, a gymnasium, the dining hall, kitchens, function rooms, squash courts, the Fitzpatrick Hall (a multi-purpose auditorium) and a crèche. For those who love experiencing history and ancient architecture, as well as age old traditions, Queens’ college, Cambridge is one of the best places to visit. Every year a new influx of students arrive, some of whom will be the famous alumni of the future, come to receive instruction from the college, alongside the other colleges of Cambridge.